onebigoutlet has no other items for sale. Sales tax may apply when shipping to: CA(9.5%), IN*(7.0%), IA*, MN*, WA*. All payments must be made within 4 days after that we do not guarantee availability of products. Buyers need to use the checkout instructions provided to ensure proper processing if other methods use it will delay processing or not process at all. We accept paypal and all major credit cards. All order process within 1 business days expect short delay on orders placed on weekends which we are closed. We reserve our rights to give full refund on invalid address and buyers with unpaid history. So far, it has been great, its beautiful and very well made. Happy with it!!! 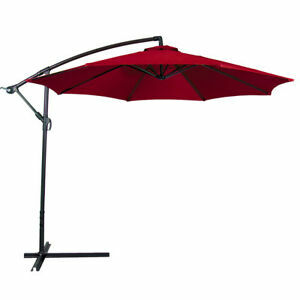 Awesome umbrella, very good value!!! Nicely manufactured, looks very nice, I like it. Very good value, will buy again. As recommended, put a couple of sand bags on base.